Read Estonian fairy tales of magic and lore from Andrew Lang’s collection. See full list of Estonian fairy tales. About: Estonians have an ancient and rich history of folklore and fairy tales that can be traced back to Slavic and Germanic roots, and their Baltic-Finnic heritage. Surrounded by the majestic Baltic sea, enchanting forests and a diversity of flora and fauna, Estonian folklore draws from the intense landscape and provides meaning for the wild world around them. “The Tontlawald.” Illustration by H.J. Ford. 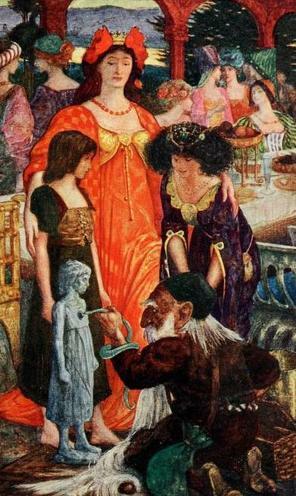 Published in The Violet Fairy Book (1906), Longmans Green and Co. The Estonian Folklore Archives of the Estonian Library are an impressive collection of what was once a solely oral tradition. Preserved in the archives are over 6000 manuscripts of fairy tales, and thousands of other manuscripts that include poems, riddles, songs and proverbs that capture the culture, history and customs of Estonians. Carefully coded and with detailed source information (i.e who told the story, and where they dwelt at the time) the collection is a comprehensive and culturally rare gem. With tales of magic forming the largest group of the manuscript archives, and animal tales coming in second, Estonian fairy tales are clearly an important part of their history and tradition. They delight young readers with stories of dwarfs and giants, treasure and adventure. Magical objects abound in the the folklore and mythology of Estonia. Babies born from eggs, and good witches called with the drop of a goose feather, magic belts and sacred stones to name a few are found in these widespread and much beloved children’s stories. The small collection of Estonian folk tales from Andrew Lang’s fairy book collections, included here, give a taste of the beauty and mystery, at times dark and foreboding, tales from Estonia.